Our range of products include desifer 400mg. Nausea, Headache, Vomiting, Rash, Dyspepsia, Abdominal pain, Constipation, Itching, Increased liver enzymes, Abdominal distension, Diarrhoea. How to use Desifer Tablet Take this medicine in the dose and duration as advised by your doctor. Swallow it as a whole. Do not chew, crush or break it. 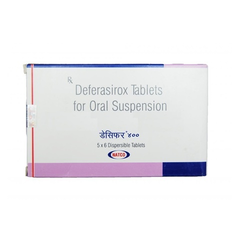 Desifer 400mg Tablet is to be taken empty stomach.